« Why isn’t my (insert your plant here) blooming? The daffodils with pinkish trumpets were still gorgeous on April 3. Is it just me, or is Spring flying by even faster than usual this year? I am running from dawn to dark and still my gardening to-do list continues to grow exponentially. In the last few weeks, I have at least been taking a few pictures, which I’d like to share today. 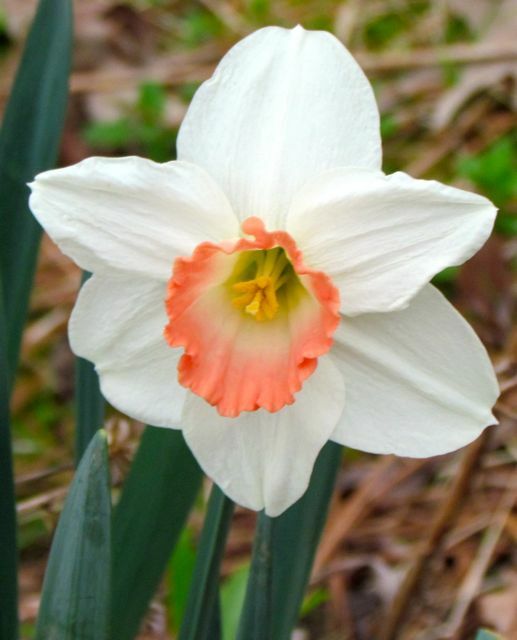 All but the latest blooming daffodils are done now, but the one in the above photo was so pretty a couple of weeks ago that I just had to share it. The above photo is also from two weeks ago, when the fern fiddleheads were just beginning to rise out of the swamp. The shiny leaves all around them belong to Atamasco lilies, which last time I checked, were not yet blooming. It took a warm spell to finally coax them from their winter hibernation spots, but the Green Anoles have now resumed sunning themselves on my front deck. 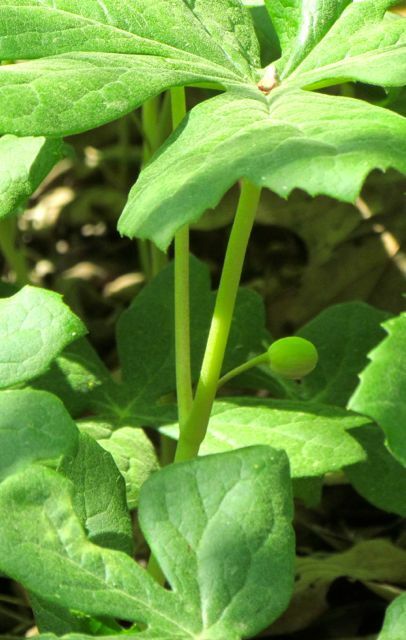 The Solomon’s Seals are now well up and blooming profusely, but two weeks ago, their fat reddish buds were just emerging from the soil. 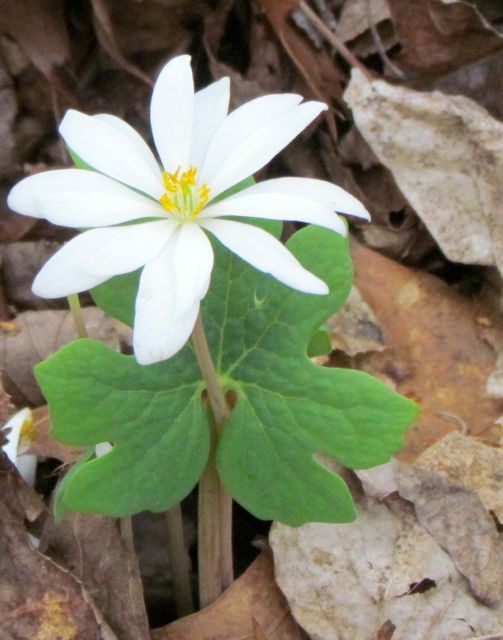 My Bloodroot flowers were badly damaged by our 18-degree cold spell this spring, but a few late bloomers managed to save themselves for warmer days. 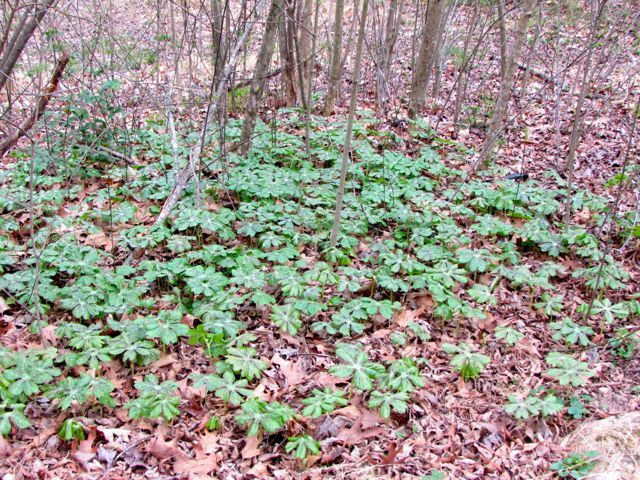 My patch of Mayapples grows larger every year, as does the patch of Bladdernut shrubs at whose feet these spring ephemeral wildflowers grow. 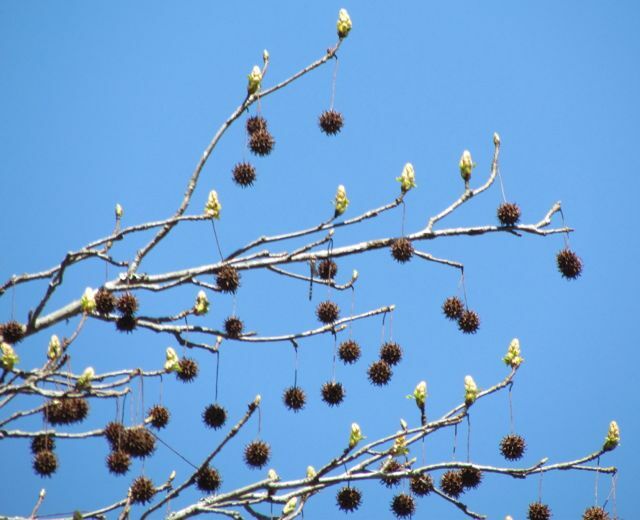 I took this long shot because I liked the way you can see this year’s flower buds emerging above the branches while last year’s fruits still dangle below them. 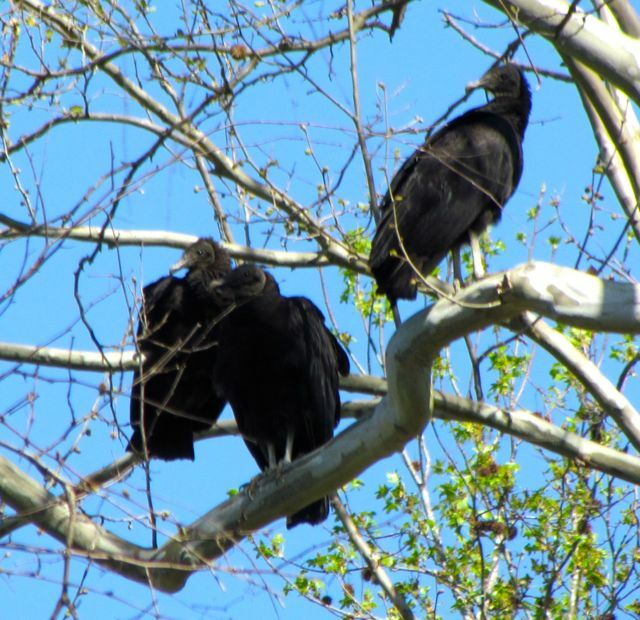 This trio of Black Vultures has been hanging out in the trees inside my deer-fence-enclosed area. I’m starting to think they’re enjoying the flowers too. The above photo and those that follow were all taken on April 12. Weather and time constraints have prevented more recent shots, but a promised upcoming dry weekend will once again provide time for photographs, I hope. 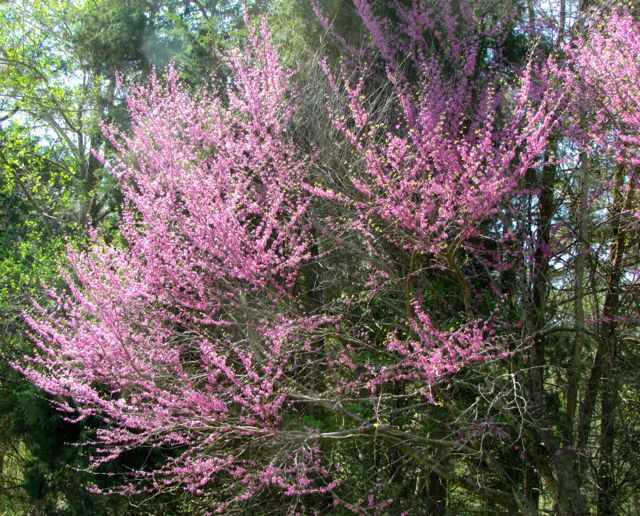 The Redbuds are mostly past their blooming time now, but a week ago they were still spectacular. The magnificent dogwoods on my property are a bit ragged from recent rains now, but they were perfect a week ago. The above was an early blossom. 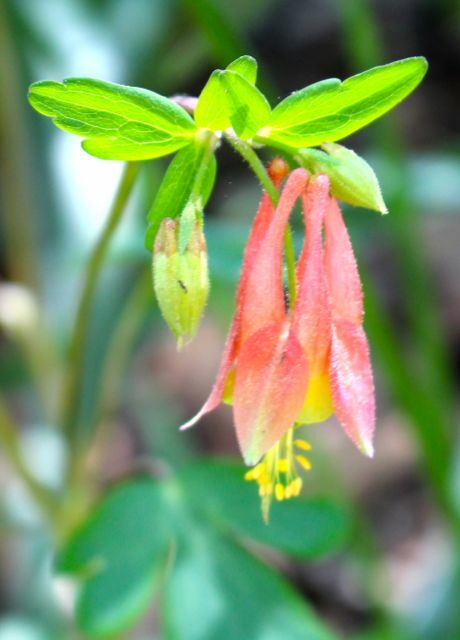 Now my yard is covered in the blooming stalks of Eastern Columbines. I’ve long known these are a favorite of hummingbirds, but only this week did I learn just how sweet the nectar is. 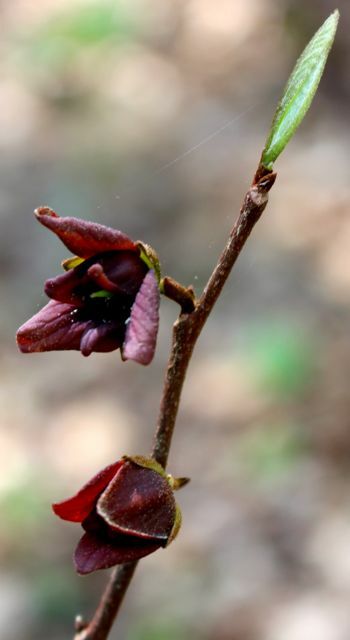 Sally Heiney, a Horticultural Technician at the NC Botanical Garden, insisted that I taste the nectar hiding in the long spurs of these flowers. It was delightfully sweet! Sally tells me these flowers are a lovely addition to salads, and I hope to try some that way this weekend. Thanks, Sally! 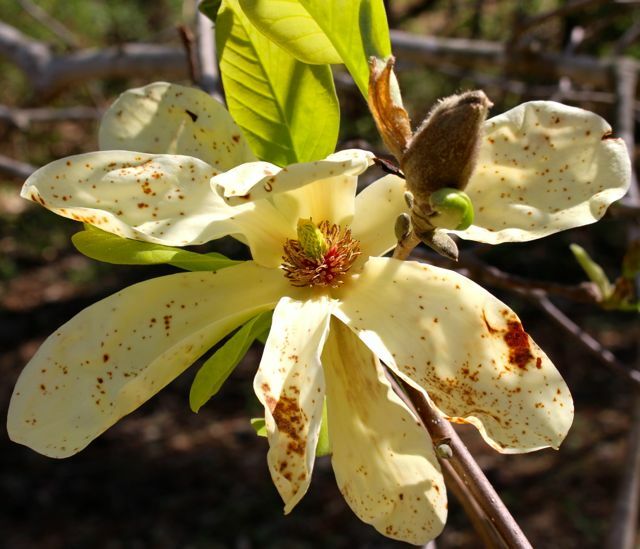 My early-blooming deciduous magnolias were also casualties of the 18-degree cold snap, but like the Bloodroots, a few of this tree’s blossoms opened after the cold had passed, yielding a perfect parchment-colored blossom. Alas, most of Elizabeth’s blossoms and buds looked like this. So sad. 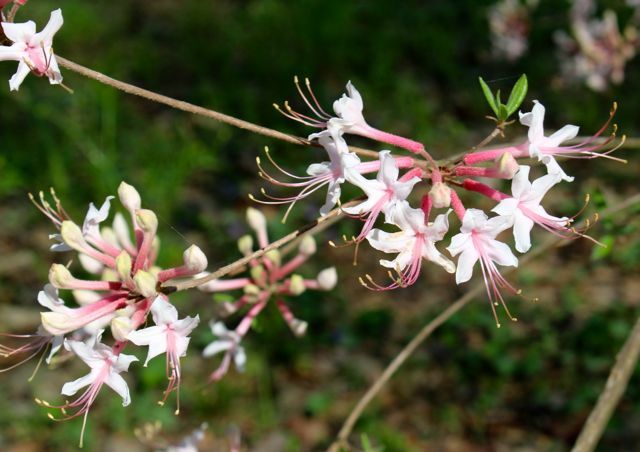 The Florida Anise-trees are blooming profusely. The yellow flecks are pine pollen. Thankfully, the rains have washed all that away — for now, at least. 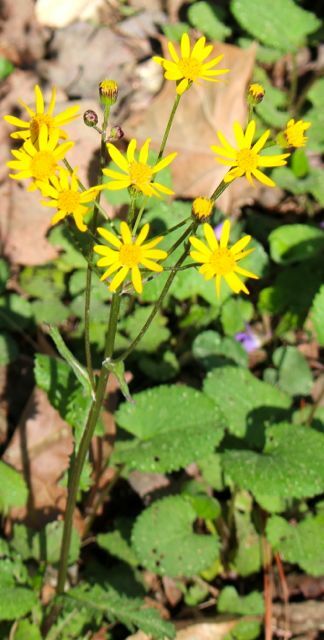 The Golden Ragworts continue to spread and bloom. They’re becoming a ground cover in their area, which is fine with me. My thanks to Wonder Spouse for taking the above photo. 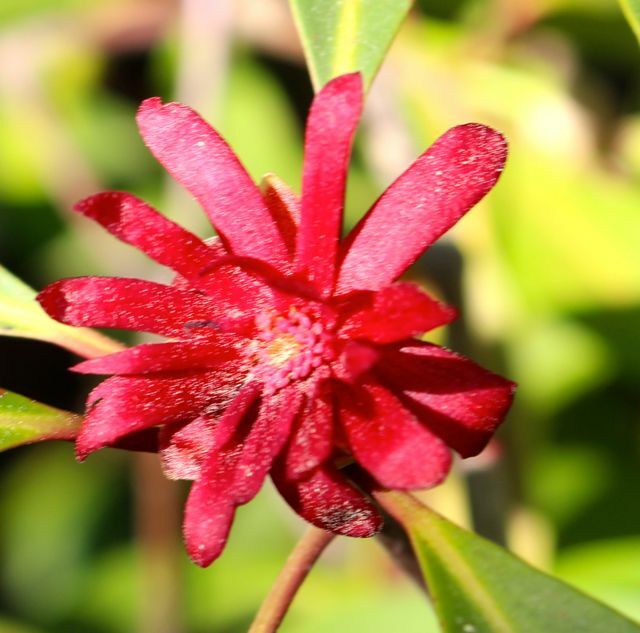 These flowers are small, and I always have trouble persuading them to pose for me. I love our naturally occurring patch of Pawpaw trees beside our creek. They are the only larval food of our native Zebra Swallowtail butterfly. And I’ve already spotted a fresh Zebra flying around the yard this year! They are gorgeous. My Pinxterbloom Azaleas are in full bloom now. They were just getting started when this shot was taken on April 12. 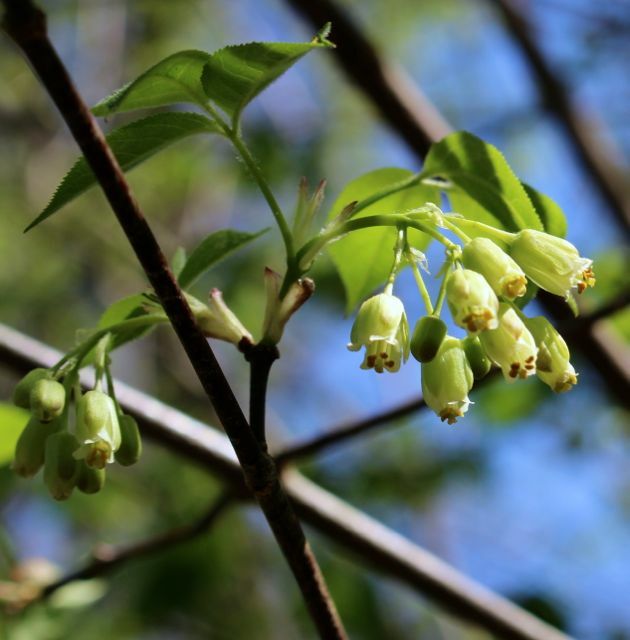 I love this native shrub for its clusters of yellow-green flowers that call to every pollinator for miles, and for their Chinese lantern-like green fruits that form after the flowers are done. 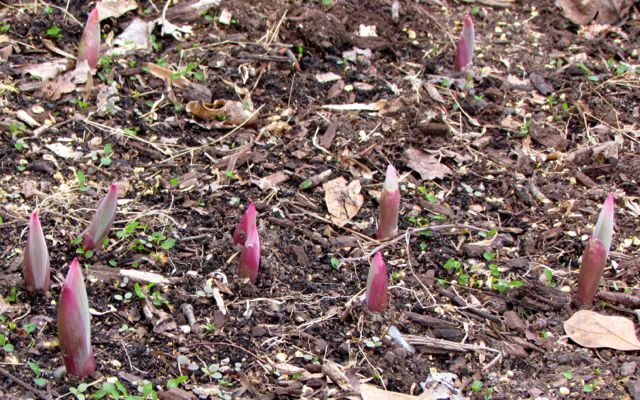 I am thrilled that the trilliums I added to my north slope garden a few years ago continue to re-emerge and bloom every spring for me. 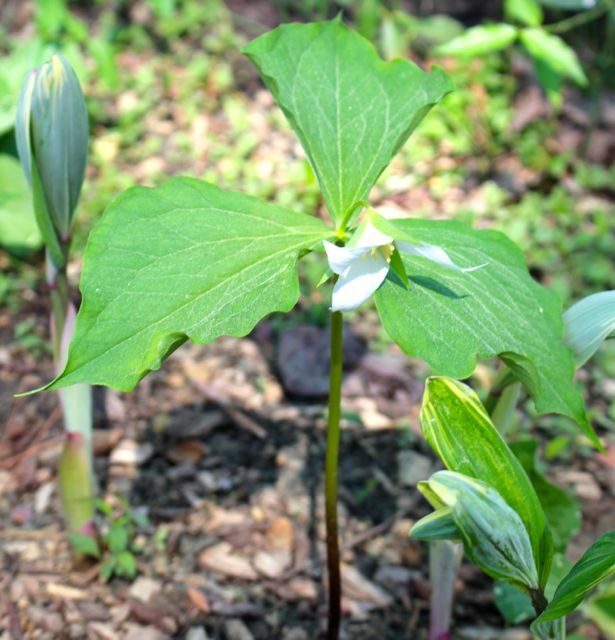 Nothing speaks of spring more eloquently than trilliums. And that’s enough for today, I think. Next week, I’m planning at least two posts. One will be my annual post in observation of Earth Day (April 22), and I’m hoping to also add one on April 24 for Arbor Day. Until then, I’ll be weeding and digging and planting as fast as my creaky joints will let me. The weather seers have promised me a dry weekend, with heavy rains returning for Sunday night into Monday. That will be perfect timing — assuming all my little green charges are safely tucked into their permanent summer beds by then. 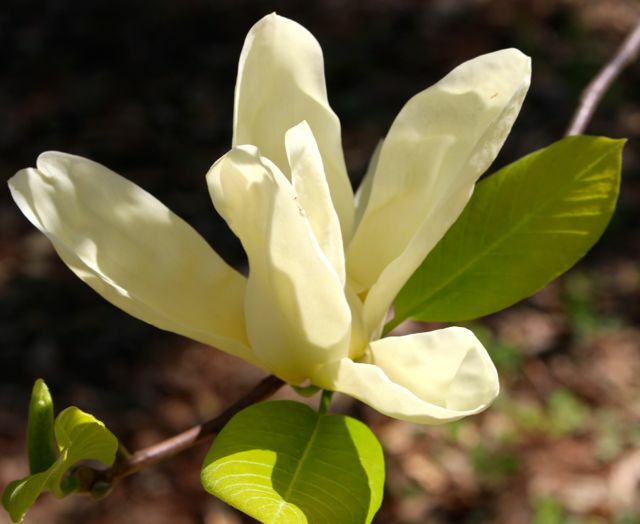 This entry was posted on April 17, 2015, 1:55 pm and is filed under Favorite Plants, Native Wildlife, piedmont gardening. You can follow any responses to this entry through RSS 2.0. You can skip to the end and leave a response. Pinging is currently not allowed. Thank you for the lovely photos. 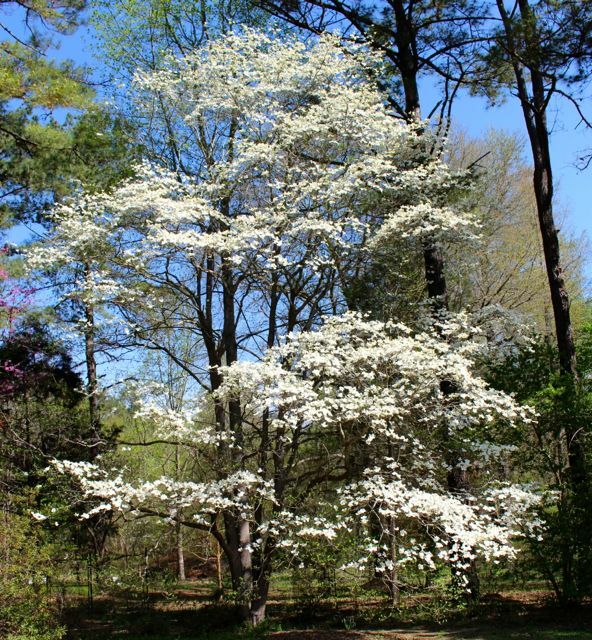 The dogwood tree is magnificent! Mine are young and I am impatient for them to grow tall. Springtime does go by too fast and I also can’t keep up, have the “creaky” joints too. Hi, Mary. I’m glad you enjoyed the photos. Yes, we gardeners must be patient as we wait for our plantings to mature. I got lucky with the dogwoods. They were already large and mature when we moved here. Despite the creaky joints, I am certain that gardening helps keep us young. Certainly the payoff in beauty is worth a few aches and pains.